I really wanted the Familyroom and Breakfast area to have a little Christmas decor, however I didn't want to redo the whole room, so I just did a little tweaking to what I had. This is what was there. Love the rooster centerpiece, so I wanted to use it again. Simple, I just took out the pillar and added three tapers, replaced the feathers with a gold glitzy pointsettia and some berries. Changed the bow, placed it on a white platter and called it done. The napkins got changed to red and black check too. Total transformation and so easy to undo after the holidays. I took the sunflowers out of the basket arrangement on the wall and added one pointsettia. I use the buffet in here as my desk, so I wanted a little Christmas here too. I showed you these pieces that I found at Goodwill, so they give this spot the perfect amount of decoration. Great little lighted tree and the Carolers are just adorable. I took the Brown and Burnt Orange pillows and throw off the sofa, added some lime and a red one that I had and a $2.88 throw from Walmart that's a red and lime plaid, spread some Santas around with a few reindeer and christmas toys and done. I think this is totally enough with all the red in the breakfast area and wait til I show you the kitchen, there's a ton of red in there too, so you defiitely feel cheery when you walk in here. 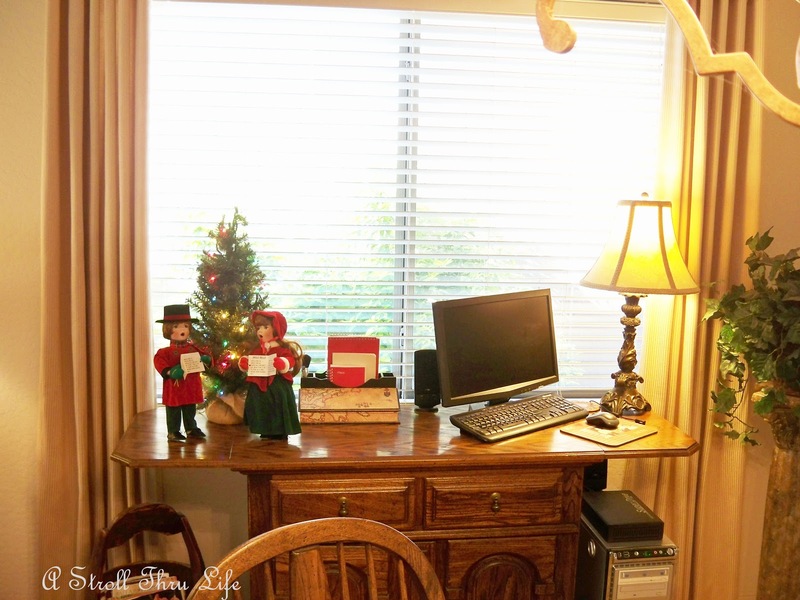 You don't have to re-invent the wheel to add a little Christmas to a room. Easy to put it all back when Christmas is over. I like that part. It all looks so festive. Love the pops of red. Love those little carolers, Marty! They are so cute! Great chef Santa, too. He looks like a good size for a countertop. I have two, but they are kind of big and I wasn't sure if I was going to use them this year. All those little touches add up to one big wow! It looks so festive! Marty, everything look so nice! Very festive, I love the colored lights and the Santa on the coffee table! 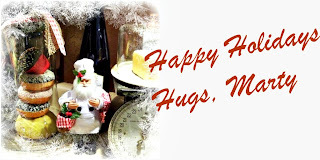 Marty love your Christmas vignettes! So pretty and your recent finds fit in perfectly too! Marty, me encantan las viñetas que has hecho, la navidad es hermosa y hay que disfrutarla a lo máximo en familia. Saludos desde C.R. Marty, so homey and elegant! Love it. Marty, it all looks so festive and pretty. love the centerpiece. thats a keep for sure since you can change it per season so easily. Everything looks great. I just love the centerpiece. So perfect for the holidays. It all looks so pretty Marty! I love your napkins! 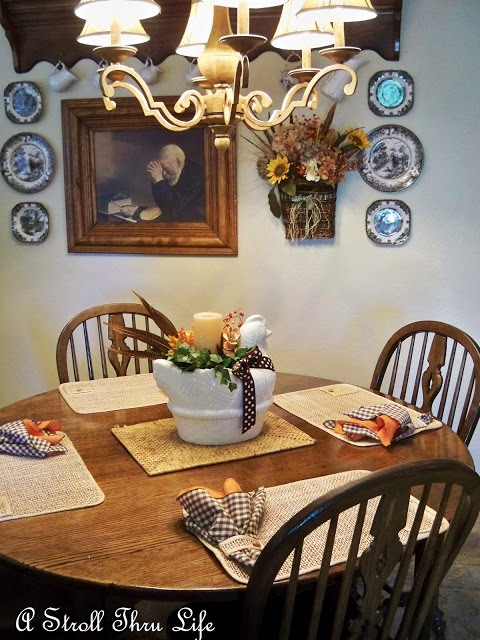 Marty, your tablesetting and vignettes are just so pretty! 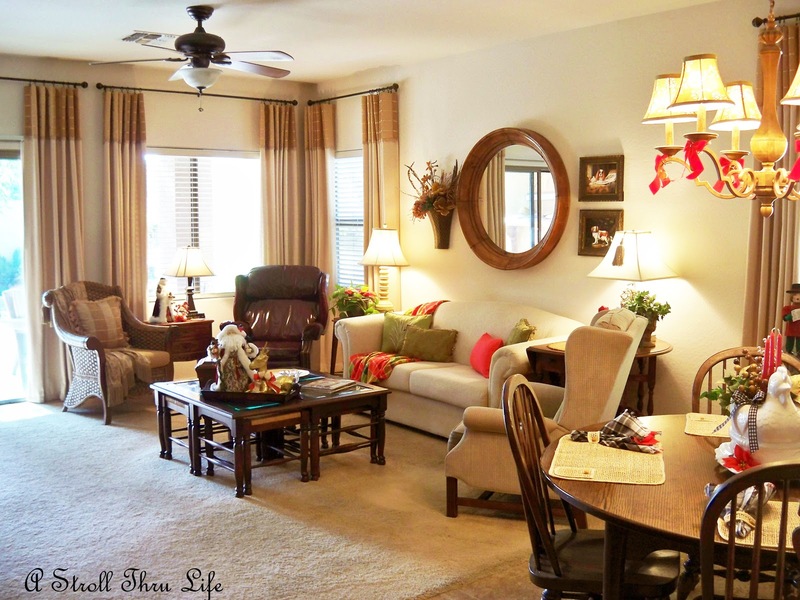 Love how you just tweaked your existing decor and added the festive accents! Very pretty! I do love your Christmas hen! Great touches to make it look very festive there! 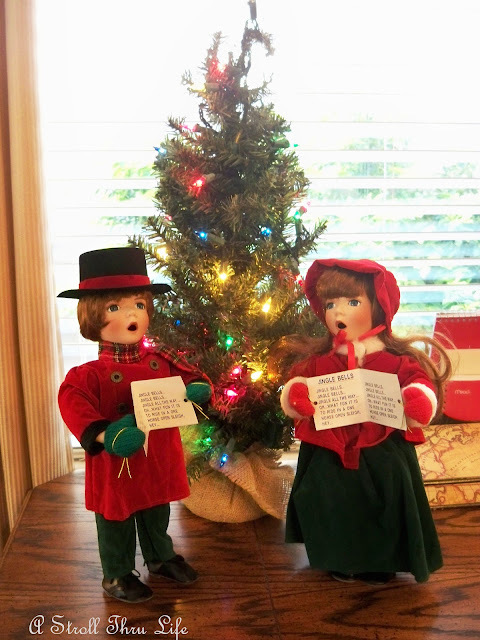 The carolers and the tree are so cute, I'm doing the same as you so it's easier after Christmas to put away! The carolers look good where you put them, Marty. Everything looks lovely. Hi, very nice your christmas decorations!!!! Your home looks beautiful Marty!I love the classic red and green. So pretty! I love all of our Christmas touches-easy to do-I reallylike that. I am tryin to simplify. I love the Christmas tweaking you have done. Isn't it fun? I also really love your Santa. He looks so cute surrounded by all that fruit. Happy Holidays! I think I may have went a little overboard, I will have a lot to put away. Your simple changes all worked out great, Marty. 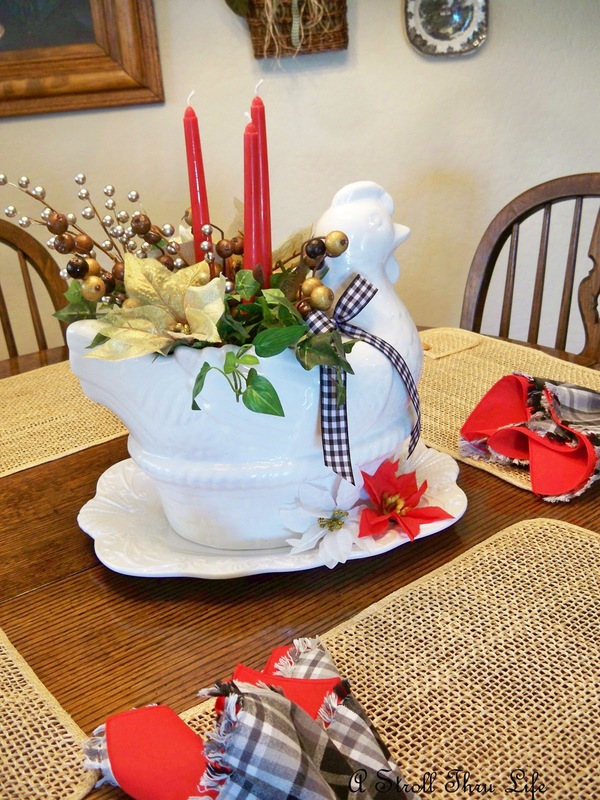 It's great to just add little touches to what's already there & have it look both pretty & festive! Love the pops of red and green for a traditional look. I love for Chef Santa! So cute!! What a beautiful room and so full of natural light! Happy holidays! Marty love those carolers! I love that room with all the beautiful light it receives from the windows- think that would be my favorite room if I had your house! The hen all gussied up for Christmas is adorable too! That's what I've tried to do this year too. I just dread the taking down and storing. I do enjoy having the touches mixed in with the usual decor. I've seen several of us doing it this way this year. Everything looks just lovely as always. 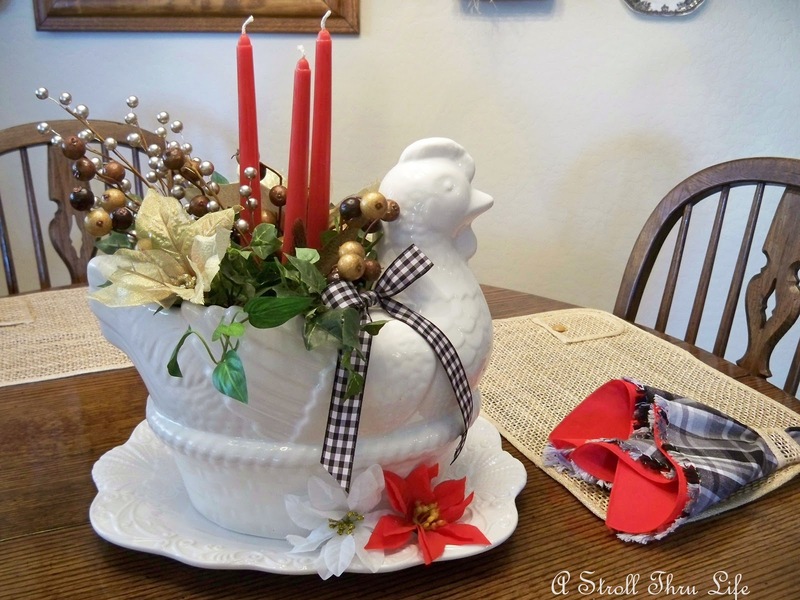 I love the chicken all decked out on your table, and those carolers are so sweet. Love all of your touches of red! It looks beautiful, Marty. I love the plate rack/shelf you have! I really love the pops of red in your home. The sofa looks cozy and the chandelier is wonderful with the bows. Very pretty! Hi, Marty! So very pretty. All your Christmas items add such a beautiful holiday touch to your rooms. Love it! Just the right amount of festive touches and the bows on the chandy are the crowning touch! So pretty! I love that mantel looking shelf above your table. Your kitchen decor is perfect. I love simple and easy put away is always a plus! I'm still loving those carolers you found at GW. A fun post! I also love your placemats with the little pockets and the straps for the napkins. Are the pockets for silverware? I've never seen any like these; such a cute idea. 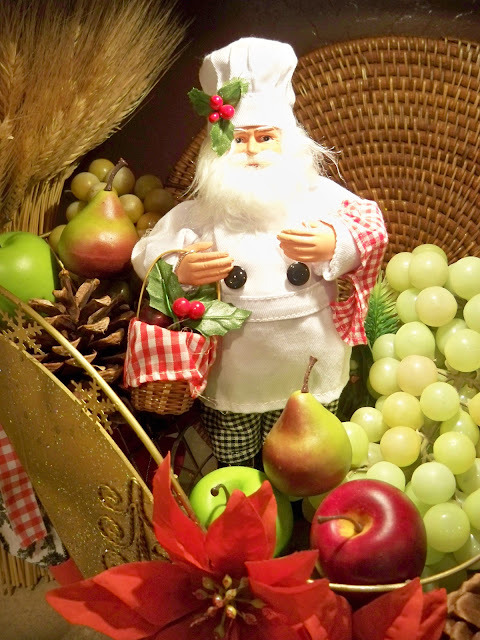 I definitely like your Santa chef in the kitchen -- can't wait to see the rest. It's so much fun to see everyone's Christmas decorations. This looks great! I like the red bows on the chandelier and your arrangement on the table! The pops of red look perfect! Hi Marty! Oh, just love it! I wouldn't have thought of using black and red but it looks so pretty. Love the sofa pillows Marty. I am just adding to my existing vignettes too. Marty, I love how you changed to Christmas so easily. Your home looks festive and inviting. Your carolers are so adorable! I love that you've added pops of Christmas here and there with what you already have!!! Do you know that your kitchen and those vignettes are my favorites of all you do??? I'll be watching for Christmas in the Kitchen @ A Stroll Thru Life!!! Everything looks very pretty Marty. 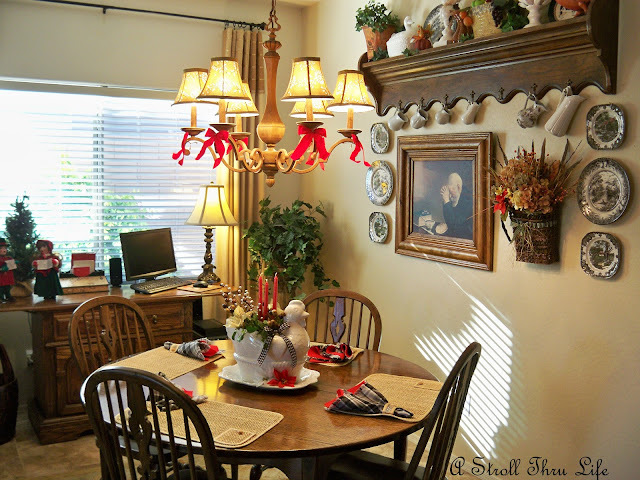 Did you know that I always study that wall grouping by your dining table? I love the combination of items you have up there. Your table looks so charming, Marty! The white ceramic chicken looks perfect no matter how he/she is dressed. 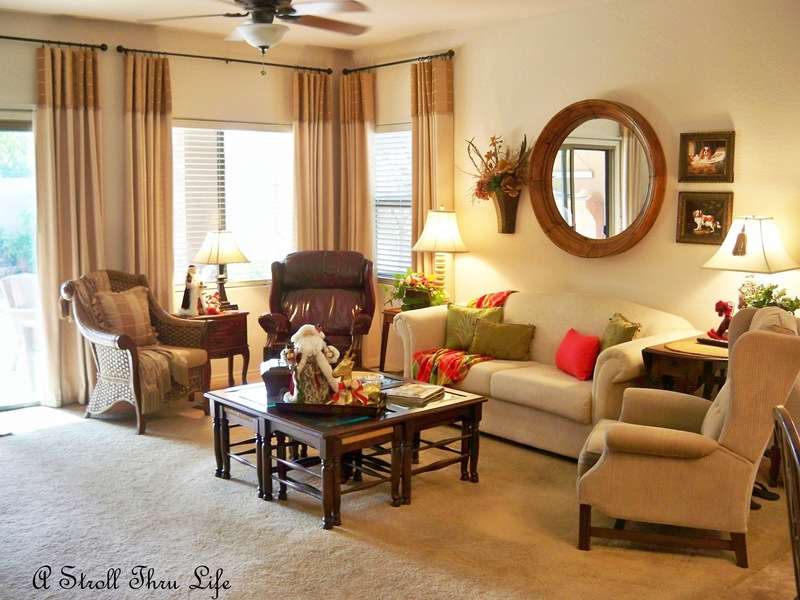 I really like your touches of red and green in your family room. Now I'm off to see your kitchen! I absolutely love the hen on your breakfast table! Such a cute piece and I like how you've changed her out for the different seasons!